You want to keep your CD (Compact Disc) and DVD (Digital Video Disc) masters and backups in a safe place where they won’t be lost, scratched or squashed. I have used a DiscGear product for many years that does the job. It is a tough plastic case that holds 20 discs. 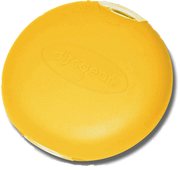 In the Canada check out Discgear The model you probably want is called the Mead Discus 20s. Mine is yellow and a slightly nicer-looking model the 22. My partner’s is bright pink, making them easy to spot in clutter. They come in black, blue, pink, red and yellow. Once I lost the case and once it was stolen. Both times I got it back with discs intact. It is a very tough case. It makes a nice gift for any computer user. All you can get wrong is the colour. The case can be opened at either end. You are supposed to open only one end at a time to access either of two sets of ten discs. If you open both ends at once, the case comes apart, which does no permanent damage, but turns the case into a silly looking accordian. It can be alarming the first few times you do it. This product is not in stock at any of the Amazon stores. These come in various colours. They are very rugged. Brittle plastic DVD covers for a single DVD are not durable. Avoid them if possible. 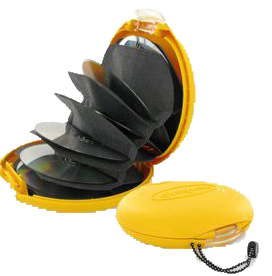 The ones made of flexible plastic, all one piece, shaped like a book are much stronger and hold the DVD more securely. The onely made of soft polyethylene shaped like scallop shells pop open too easily.